OK, a warning, I am feeling a little sappy today. This week would have been my mom's 69th birthday. She died in 1994 and I miss her everyday. I am still close with her sister, my Aunt Connie, who turned 75 earlier this year. The Hub and I try to get out to visit her at her home in NJ every once in a while. We usually go to have a good Italian "Sunday Dinner". This means lots of pasta and meat, eaten at about 3pm on a Sunday afternoon with a good helping of wine on the side. Growing up, we used to have these dinners every Sunday at my Nana's. It's a real North Jersey Italian tradition that I have come to realize over the years is somewhat unusual. Most people I know who are not from the area ask: "Is it lunch or is it dinner?" "Do you eat again later in the day?" And, my favorite, "WHY do you call the red sauce gravy?" (a uniquely North Jersey Italian term). If you have ever watched The Sopranos, which was set in the town next to where I grew up, you would have seen them eat Sunday dinner and call the pasta sauce "gravy". It was just like that at our house, but without the guns, gangsters and violence. That show was validating to me in a weird way. So anyway, back to my aunt. I love visiting with her because she appreciates the company, and I adore how she reminisces about my mom, my Nana and the "good old days". The moment really hits me when I spend time with her---that is, just how important it is to listen to the stories of our elders (even if they repeat themselves sometimes). I gobble up each word as if it were the last piece of cheese on the cold antipasto platter. 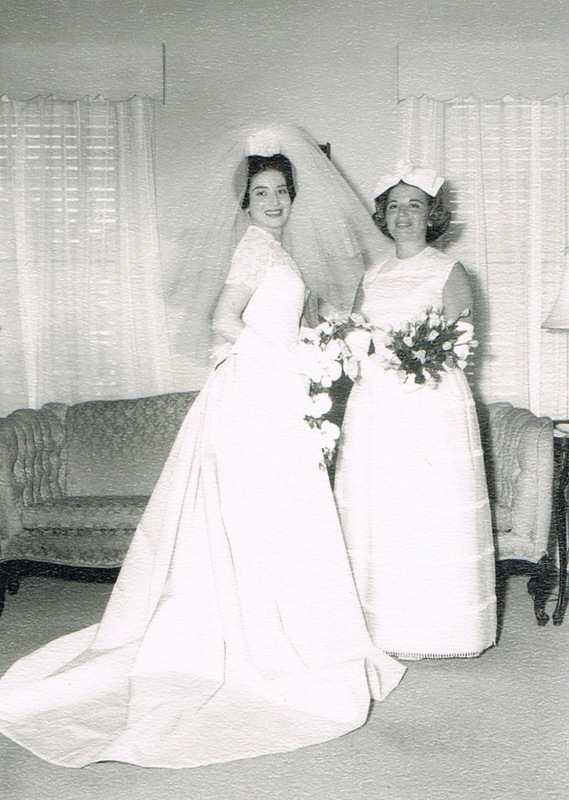 I looked through some old pictures today and found these two of my Aunt Connie and my mom together on their respective wedding days. I LOVE old photos and am amassing quite a collection. As the years go by, my aunt has become my only source of stories about that side of my family. And although sometimes our own busy lives get in the way, I vow to keep making time not just for new memories, but to revisit the old ones before they disappear. What wonderful photos. I love looking at old black & whites. Thanks for sharing these. That is lovely. Just a really lovely post. And both your mom and your aunt are gorgeous! What a lovely post, with lovely photos, and lovely thoughts. Those photos are incredible! Family memories and relationships - friendships even - are so important as we get older. Thank you for celebrating your mom, your aunt, your family today with us - and for linking up. I loved your post and adored the photos! 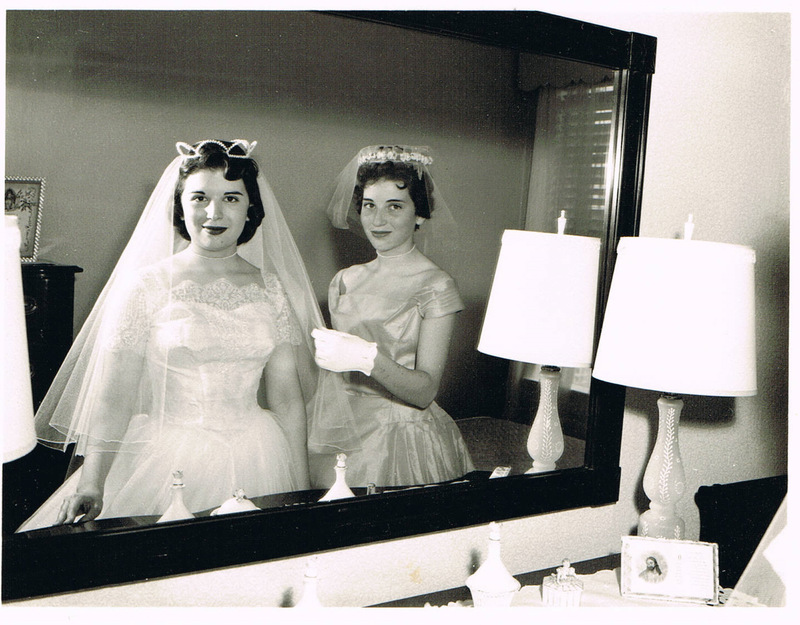 I especially love old wedding photos! 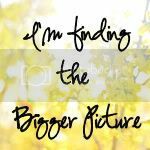 I have been feeling a litte nostalgic myself lately...As I get older and my boys do to, I see more and more how things aren't how they use to be. I need to be better at taking my boys around their great grandparents more often so they too can grow up with those stories. Thank you for sharing! Beautiful photos! They remind me of my mom's wedding pics. And the whole "gravy" thing? Not just North Jersey. My Brooklyn-born & raised Italian-American family still calls red sauce "gravy." My favorite by far is gravy with a nice piece of godona (called "Cotechinata" in the only online references to them that I could find) in it...yum! Oh wow, what amazing photos, and your mother and aunt are gorgeous! I love old photos like that, too. I have one of my Grandpa when he was in the Navy, and I cherish that picture so much. I think it is wonderful that youhave these stories and pictures. My grandmother used to always repeat stories too and I sure to miss them. I love old pictures...even people I don't know! What a great blog! I very nice tribute to the people you love. I love the pictures you take. I stop by as much as I can to just check it out. Your mom was a beautiful lady...thanks for sharing those pics. I think it's hard losing your mom at any age. My mom will is now 78 and I cherish every moment I get to spend with her. Gorgeous photos. Your post bought tears to me. I still miss my mom too. And for years her sister Marge reminded me of her. But now aunt Marge is gone too. They both look like classic beauties in your photos. Nice pics of Vietnam too! Beautiful post and pics. Your mother was lovely in her gown. Such wonderful memories. It's nice that you have a closeness with your Aunty to share family memories and love. I LOVE old wedding photos! They look so much more elegant (IMO) then today! Beautiful photos! Thanks for sharing those memories! I love those photos, your mom and aunt are beautiful! My family, not Italian..but they confuse me with having special dinners at around 3..the same question, is it lunch or dinner?? Oh, dear, yes. It is so important. I just lost my dad, and I've never hung on the stories others tell about him the way I do now. It's so important for keeping the memory alive. Thank you for this beautiful post - a reminder I need to call my mom and spend more time with her while I can. I am glad Alan mentioned your blog in his new Sepia Saturday post - you will enjoy this group very much. Sorry to arrive at this fabulous post so late. I enjoyed every word. Already looking forward to more. I'm so sorry that your mom passed away when she was so young. How hard for you. I must say she looks happier as a bride than she did as a bridesmaid! She's beautiful. Good thoughts in your post. What I wouldn't give for a few of those family stories. I came from a family of non-story-tellers! I have a photo similar to this one, where my aunt is helping my mom dress for HER wedding. You are so right in advising that we listen while we can. When I was a youth and even a young adult, my dad used to go on and on about every anniversary in the year where he had been somewhere while in the British Army. I barely heeded his words and later in life I kept asking him to write it down, but he never did. He developed Parkinson's and Dementia and it was beyond his ability. Now I'm the one trying to fill in the gaps, and it's next to impossible! I so wish that I had paid attention. I do regret that now that he's gone. Love your blog, and your dog too! Sorry, that was a really self-indulgent comment, but you sparked so much in me. That's the indication of a fabulous, well-written post, which is what it is.